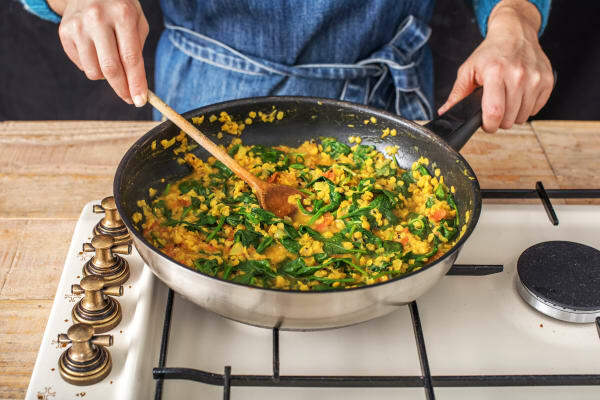 Packed with delicious, good-for-you ingredients, our warming butternut squash dal is the perfect recipe for cosy nights at home. 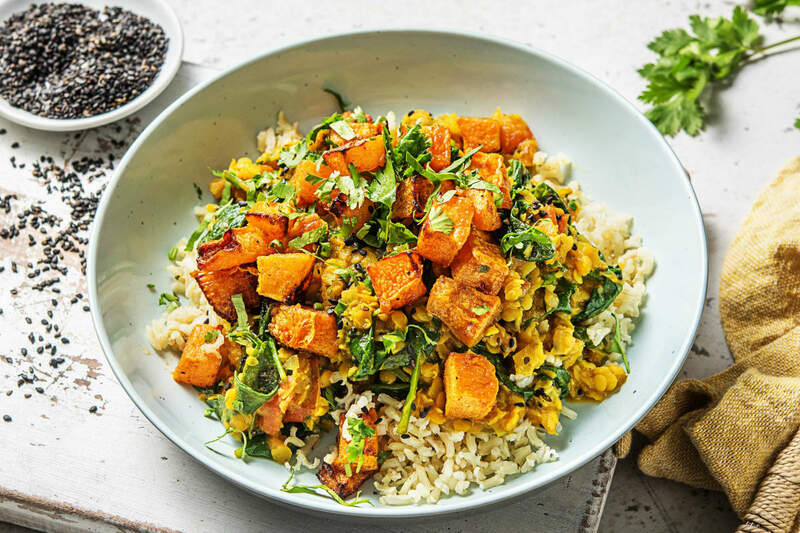 Bright, delicious, and a rich source of Vitamin A and potassium, butternut squash is a great vegetable to bulk out stews, sauces and curries. 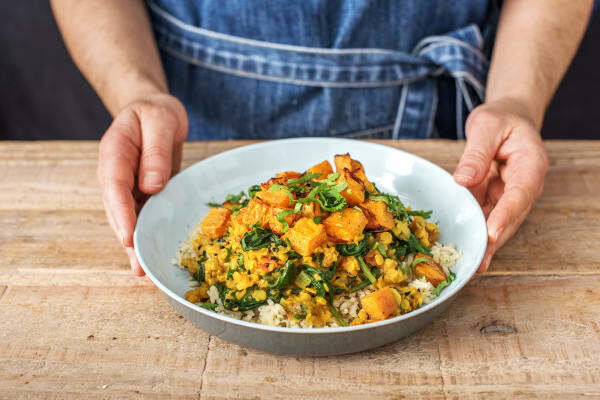 In this recipe, we’ve roasted the squash in cumin, adding it to the dal at the very end, bringing a sweetness to the dish that works brilliantly with punchier flavours like ginger, turmeric and garlic. Served with nutty brown rice to keep you feeling full, this wholesome dish is a guaranteed crowd-pleaser. Preheat your oven to 200°C. Fill and boil your kettle. Halve, peel and chop the onion into small pieces. Peel and grate the ginger. 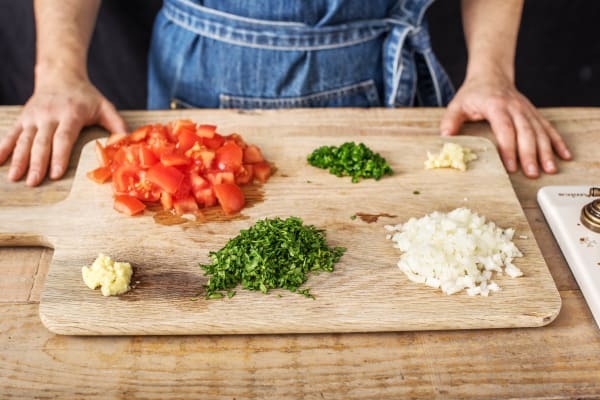 Peel and grate the garlic (or use a garlic press). Chop the vine tomato into 2cm chunks. Roughly chop the coriander (stalks and all). Halve the chilli lengthways, deseed then finely chop. 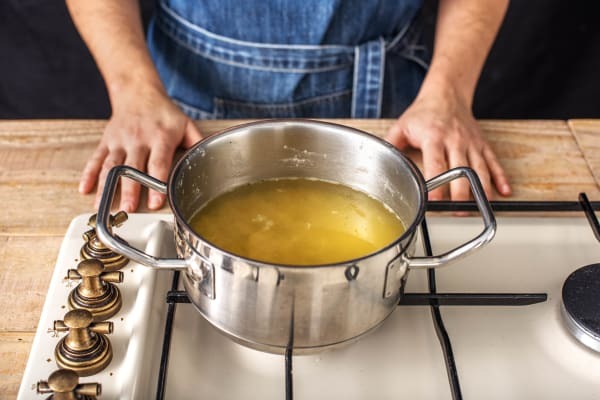 Pour the boiling water from the kettle into a large saucepan and bring back to the boil with a pinch of salt. When boiling, stir in the brown rice and half the stock powder. Cook for 25 mins. tTIP: Add more water if it starts to evaporate too much. When cooked, drain the rice thoroughly in a sieve and return to the saucepan, off the heat. Cover with a lid to keep warm. 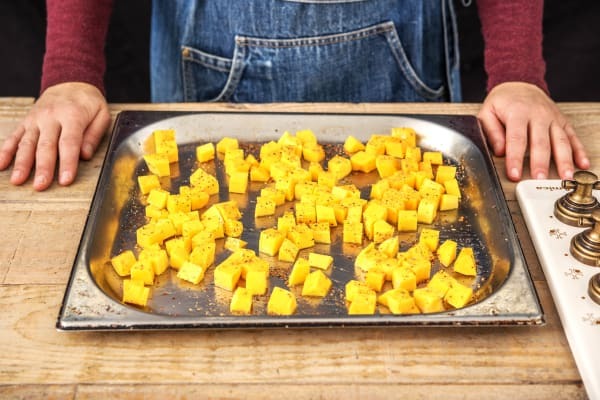 Meanwhile, pop the diced squash onto a lined baking tray and sprinkle over half of the ground cumin, a drizzle of oil and a pinch of salt and pepper. Toss to coat the squash well, then arrange in a single layer. Pop on the top shelf of your oven and cook until tender and golden, 25-30 mins. Turn halfway through cooking. Heat a splash of oil in a large high-sided frying pan on medium heat. Once hot, add the onion and cook until soft, stirring occasionally, 3-4 mins. Mix in the ginger, garlic, turmeric, nigella seeds, remaining cumin, vine tomato and as much chilli as you dare. Cook for 1 minute. 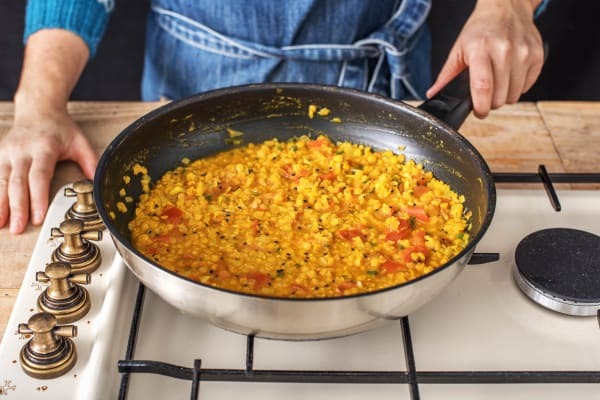 Rinse the red lentils in a sieve then add to the pan. Stir well to coat the lentils then add the water (see ingredients for amount) and remaining stock powder to the pan. Once everything is ready, stir half the coriander through the dal and season to taste with salt and black pepper if needed. Share the rice between your bowls with the dal spooned on top. Finish with a stack of butternut squash and sprinkle over the remaining coriander. Enjoy!